Spring is all about freshness and renewal. Rebirth and all that good stuff. We’re packing away our heavy and dark clothes, and brightening and lightening everything up. That’s where the chambray and white trend comes in. This is really such a classic look, that you don’t have to feel guilty about spending the splurge money. You’ll wear these pieces over and over, season after season. However, we all know that it’s not always feasible to spend $1500+ on an outfit. 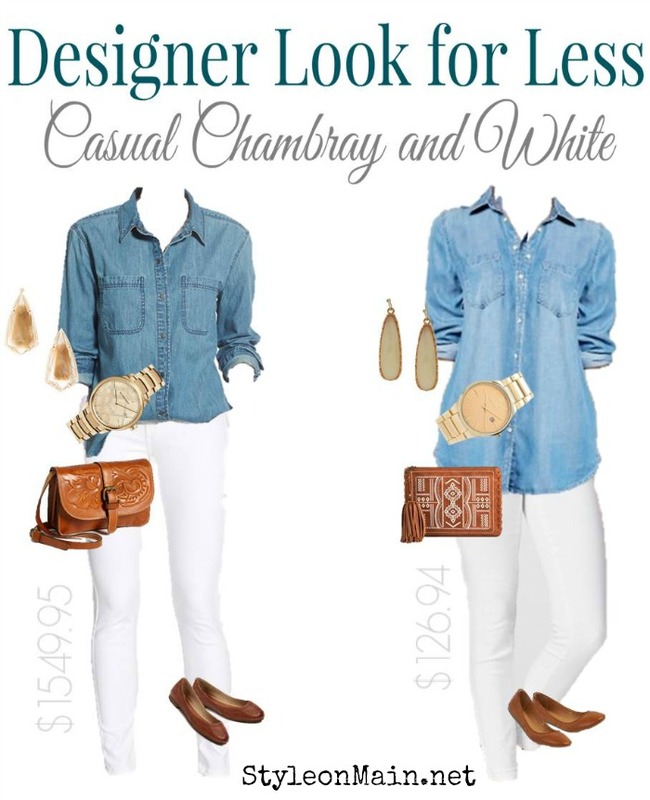 We’re showing you how to get the same chambray and white denim look for right around $125. Heck yeah! All items are from Nordstrom. Treasure and Bond Chambray Shirt ($78) – This isn’t a bad price for this shirt. You can shop around and probably find a chambray shirt for $40-50. These basically never go out of style, and are a total wardrobe staple. James Jeans Skinny Jeggings ($150) – White denim is ALWAYS hot for spring and summer. Continue the trend this year with these jeggings. Or look for a cheaper pair. Frye Carson Ballet Flat ($158) – This is a perfect timeless shoe, that will last and last. Frye products are amazing quality, and good shoes really are worth the money. This is a splurge I can fully support. Available in 8 great neutral colors, too. Patricia Nash Torri Tooled Leather Bag ($99) – Not a bad price for something that really is a classic style. You can probably find a tooled leather bag for about half the price, though. Kendra Scott Carla Stone Drop Earrings ($70) – These are made with actual semi-precious gemstones like Mother of Pearl, Amethyst, Amazonite and others. So, it’s not a bad price for nice costume jewelry. Burberry Checked Stamped Bracelet Watch ($995) – Are you kidding me?!?! Yes, this is Burberry. Yes, this is a very nice watch. Uhhh…it’s still costume jewelry (goldtone/stainless). For this price, you can get an actual gold watch that’s pretty awesome. All items are from Target. Merona Tencel Tunic ($27) – Not actually a chambray shirt, but it sure looks like one. This might be cooler in the warmer weather, too. Mossimo Mid Rise Jeggings ($30) – For this price, you almost can’t go wrong. White jeans are one of the classic pieces of summer. Ona Scrunch Flats ($17) – So cute, and they go with just about everything. Showin in Cognac, but the striped and watercolor floral are pretty fab, too. Available in 8 colors. Mossimo Embroidered Pouch with Tassel ($17) – While it’s not tooled leather, this bag lends the same ethnic vibe and total casual chic feel. Drop Earrings with faux Stone ($8) – These are super cute, and very on trend. They’re goldtone with resin faceted drops. Super lightweight, too. Plus, how can you even go wrong for $8?? Women’s Journee Large Face Bracelet Watch ($27) – All of the look with like, none of the price tag. This is an attractive and totally classic watch that comes in under $30. Also available in silver tone and rose gold tone.